1879: Actual Play: Building the Perfect Byron – FASA Games, Inc. In this Actual Play installment, we’re going to create a new character to join Our Heroes. Sam and Bethelie are going to need the help of a Byron, someone who knows not only the Engines that control information and so many automatic systems throughout both worlds, but understands the workings of finance and telegraphy and cryptography. We’ll walk through the player decisions as we create a character who’s at home equally in the hideously complex machinery of a clockwork mainframe computer and the equally terrifying complexities of banking and international monetary transfers. Forthwith, the Byron! Our player starts by rolling dice. Points buy is an option, but our player likes the risk of generating Ability scores by a more random means. Rolling 4d6 and discarding the low die six times, our player gets scores of 10, 11, 11, 16, 13, and 14. Perhaps the player would have done better to use the points buy method … At any rate, Thierry Dessalines, from the British West Indies, has begun his career as a Byron. The player looks ahead and picks out starting Skills for Thierry, as the Attributes that these go against will help determine where to put the numbers. Engine Programming goes into the Profession Skill slot, with a free Rank. With ten Ranks to distribute across Thierry’s Profession Skill and starting Skills, the player could choose to bump up Thierry’s Engine Programming and forego a Skill out of the Core and Optional pools, but decides against it, figuring that Thierry should be more diverse than focused. He’s from a somewhat rough and tumble environment, after all, that’s going to demand a lot more than just coding. The player puts a Rank in each of the ten possible Skills, and looks at the Attribute tally. Six Skills go against PER, two each against CHA and DEX, and one against WIL. Thierry’s player puts the 16 into PER, the 14 into CHA, and the 13 into DEX, figuring Thierry is going to be a bit of a charming rogue and try to talk his way out of situations (or into them) rather than resorting to violence. The 10 goes into STR, leaving the two 11s for TOU and WIL. Those are going to need attention later on. For his two starting Knowledge Skills, Thierry’s player picks Politics and Trade Routes, both very useful for survival as an independent operator in the West Indies. Each of these gets one free Rank. Thierry’s player then debates about the character’s General Skills. Streetwise would be useful, but it’s on the Profession list at Novice, as are many others that Thierry would really like to know starting out. Etiquette is an Optional at Journeyman, Conversation at Master, Flirting and Winning Smile at Warden, but Seduction isn’t on the Profession lists, and that would be useful for a charming rogue. On a whim, the player gives Thierry Pilot Vehicle as his other Free General Skill. He might need to steal a lorry at some point, you never know. The five Ranks for General Skills go into these new Skills at one each, one Rank each to Speak and Read Language so that Thierry is bilingual in English and French (appropriate to his origins), and the remaining rank to Speak Language to add West Indies Creole. This is an overgeneralization that encompasses all the regional creole languages, abstracting the polyglot nature of the Caribbean for ease of game play. Now the player is going to bump up Thierry from Initiate to Journeyman, with a Professional Rank of 5, to bring him into line with Sam and Bethelie. This starts out with an allocation of 16,000 AP from the GM, which is just a bit more than the minimum of 15,200 required to advance to Professional Rank 5. We’ll skip the accounting for this, if you don’t mind, and just state that the player spends the appropriate APs for increasing Skill Ranks, buying new Skills, and buying Attribute increases. Let’s start with the Attributes. Thierry has 4 increases available, for going up 4 Professional Ranks. That Charisma of 14 is two short of the Step breakpoint at 16, so the first increase goes to Charisma. The player would like to go a second point, but needs it elsewhere. This does bring up Thierry’s Social Defense by a point, so there’s a gain here. Two of the increases go to Willpower, to bring it up from an 11, which is just barely above average, to a 13, where the Step breakpoint occurs. The last goes to Toughness, bringing it up from an 11 to a 12. This doesn’t bring up the Step, but it does increase Thierry’s base Death and Uncon Ratings, and every little bit helps. One more Toughness increase and Thierry’s Wound Threshold and Recovery Test count will both go up, so that’s in the plan for the advance from PR5 to PR6. That piddly 10 Strength is just going to have to do. Thierry is a lover, not a fighter. Building up the necessary 7 Core Skills to a Rank of 5 starts with the 5 Core Skills chosen at Initiate Rank. Thierry’s player then picks Streetwise, at PR2, and Graceful Exit, at PR3, to be the other two. Engine Programming gets bought up to a 6, one higher than the minimum required for the PR5 advancement, as one’s Professional Skill should always be a little higher than minimum, now, shouldn’t it? 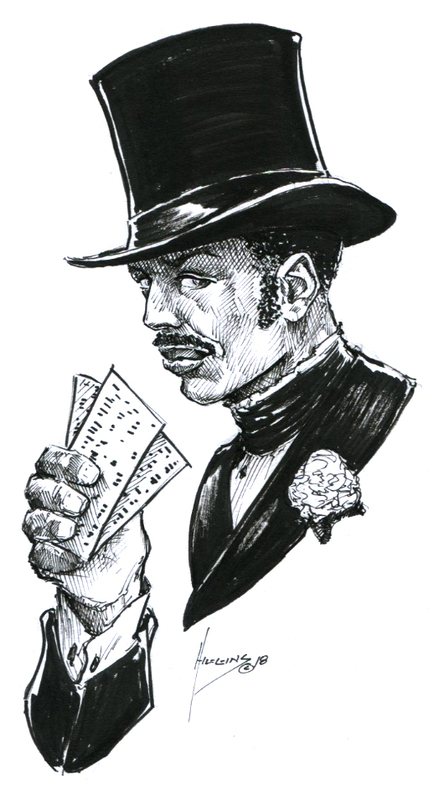 The player then buys up Thierry’s Initiate Optional Skills to a Rank of 4, plus his Novice Engaging Banter and Knowledge (Telegraphy). Lock Picking and Research, Thierry’s remaining Novice Core/Optional Skills, get bought up to a Rank of 3. (1879, unlike Earthdawn, does not require one Skill from the current PR to be at the advancement minimum Rank, only that there be enough Skills at the advancement minimum.) At Journeyman, the player buys 2 Ranks each in Fast Hand, Forgery, and Sprint. In keeping with the minimum advancement we’re doing here, the player buys 5 Ranks in Durability, equal to the PR we’re advancing to. These give Thierry his Toughness Step per Rank added to his Unsconsciousness Rating, and his Toughness Step times 1.2 per Rank (rounded down) to his Death Rating. When the player buys up Toughness at PR6, this will get recalculated, as that will raise Thierry’s Toughness Step. For now, Thierry gets 25 points added to his Uncon and 30 points added to his Death Rating, slightly more than doubling his Base Ratings in each. The player goes through and fills in Free Skills at each PR, giving them Ranks of 4 at PR2, 3 at PR3, 2 at PR4, and 1 at PR5. This isn’t quite realistic as to how it would come out if Thierry had played through those PRs to advance in real-time, but it’s close enough for what we’re doing here. At PR2, the player gives Thierry Empathic Sense and Melee Weapons. The first is useful for someone who’s got a more Social approach. The second maybe gives a bit of a lie to the “lover, not a fighter” approach, but sometimes desperate times call for desperate measures. At PR3, Thierry branches out a bit into mystic disciplines, and learns Empathic Command. That Willpower boost will come in handy when trying to enforce his will over someone else. Anticipate Blow helps keep him out of the way in a knife fight. Because by PR4 he’s got some serious enemies, Thierry learns Poison Resistance as his final Novice-Tier Free Skill. At PR5, he continues his leaning toward the mystic and learns Resist Magic. Hey, everybody gets tired of being zapped by the magicians sooner or later. He also picks up Second Shot, so that he can get in another round without quite so much of a penalty, having learned that he’s better off staying in cover and shooting than going out and confronting his enemies when possible. To round things off, and return to the Social approach, he takes Steely Stare as his last Free Skill on making Journeyman. Now his Charisma has real force behind it. At Journeyman, Thierry has a Renown of 12 and a Reputation of 2. He’s also still got a Social Level of 1, as Byrons are not well thought of by the authorities. He does gain +1 to his Social Defense for making Journeyman as a Byron, gets a +1 Step to his Karma, which raises his Karma die from a d8 to a d10, and he can spend Karma on any Perception-only Test, which means the player no longer loses the option of Karma when the Awareness Skill isn’t appropriate and Thierry has to default to his Attribute. Now all that’s left is Equipment, and the player consults with the GM for what is reasonable for a PR5 character to own and be carrying. Here’s a link to Thierry’s completed character sheet, if you’d like to play along at home. Can’t tell the players without a scorecard.